Zebra Technologies™ is a global leader in barcode printing, mobile computing, data capture, and related capabilities. Zebra offers a complete line of ruggedized handheld computers with built-in bar code scanners. These Android-based devices have a wide range of applications including delivery tracking, assisted selling, and asset management, to name a few. Many of these applications fit perfectly with the Couchbase Mobile stack supplying the backing data platform. Since Couchbase Lite is a true, full-fledged NoSQL database, you have the performance of on-device data combined with easy off-device synchronization. To demonstrate one use case, we built a sample inventory scanning application. The data consists of information about a fictitious set of books. Scanning ISBN bar codes pulls up the information from the Couchbase Lite embedded database. It relies on the Zebra DataWedge service for ISBN barcode scanning. The entire application, along with sample data, is available on GitHub here. This post will examine the code. To see the demo in action, and to find out more about Zebra and Couchbase, watch this Zebra DEVTALK webinar. The application consists of a single Activity. Couchbase Lite gets integrated as a library in the project. The application gets installed without any data. We store the inventory data on Couchbase Server. The device data will get populated at run time using a two-way replication. 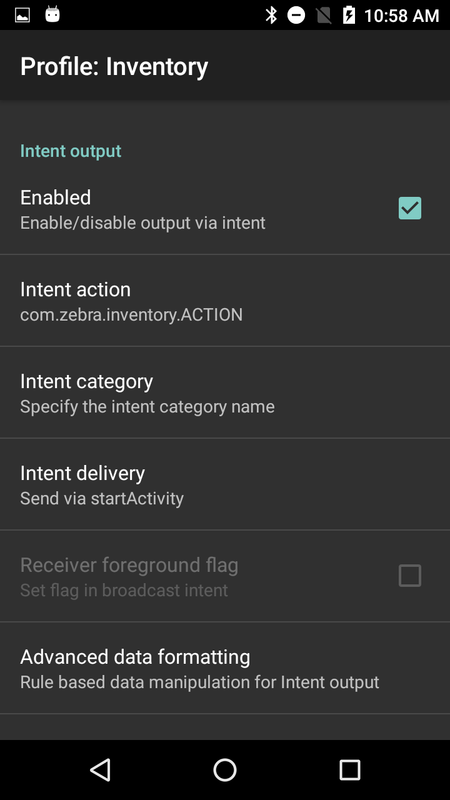 DataWedge makes elegant use of the Android Intent system. This requires configuration of a profile. These screenshots show the options used here. Note in particular the “Intent action” setting. We’ll need the same string in the application itself. To keep the app compact, we initialize the database in the onCreate method in the ScanActivity class. We also set up the replication there. This is all straight-forward. The endpoint is the address of our Sync Gateway instance. Setting the replication to continuous causes Couchbase to constantly update the database in the background. Zebra devices have dedicated hardware to trigger scanning. We added a button in the UI to do so as well. The callback for button clicks shows how to use the DataWedge intent-based API. Just fill the intent with a few key strings, and let Android handle the rest. Once triggered, the scanner lights up and will capture data in the background. If successful, the barcode information is returned, also using an intent. We configured DataWedge to deliver the intent using startActivity. This is where the Intent action setting comes into play from the profile. We set an intent filter in our Android manifest to match the string from that setting. By default, this would normally create a new instance of the corresponding activity. Here, we just want to keep the same activity going and let it process the result. We do that by setting the activity launch mode to singleTop. This means the intent will get delivered via the onNewIntent method. This doesn’t affect the original intent that started the activity in the first place. We use a common pattern of resetting the activity’s intent to the new on in onNewIntent, and then processing it in onResume. Inside onResume, we do a check to see the intent matches what we expected. After that we pull out the ISBN number and perform our query. Couchbase Lite uses a builder-style interface to create queries. The API is designed to map directly to a SQL statement. Here, the equivalent SQL would be SELECT * FROM inventory WHERE isbn = "<scan result>";, where <scan result>represents the string handed back to us. That translates to this code. This dynamic query capability was added in Couchbase Lite 2.0. It’s based on Couchbase’s N1QL query language, which is a superset of SQL. For a deeper introduction to queries in Couchbase Lite, I recommend reading this blog post. With the query object in hand, we execute it and retrieve the results as a list. We expect each ISBN to correspond to a single book. 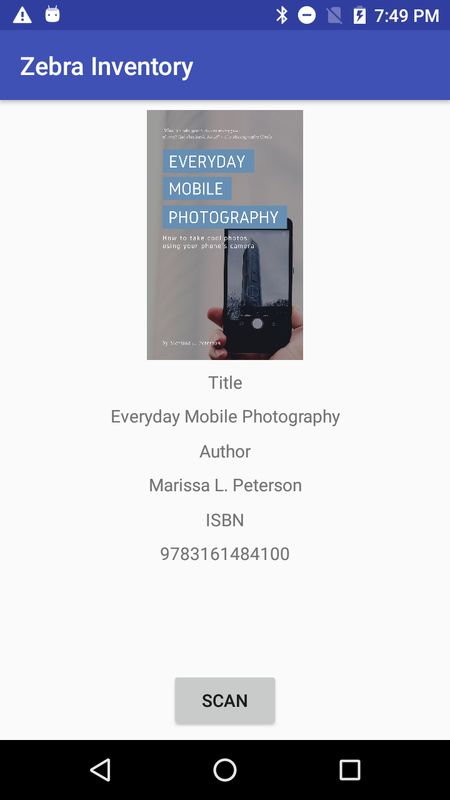 If successful, we show a thumbnail of the book cover and other information. If the book is missing or we get more than one result, we show an error in place of the book cover. This code is wrapped using RxJava so the query runs on a background thread. We retrieve the whole document contents as a Dictionary object. (Dictionaries are immutable data structures with map-like semantics defined by Couchbase Lite.) We need to convert the book cover image, attached as a blob, to a bitmap. For convenience, we convert the dictionary to a map, create the bitmap, and add it the map. That gets passed on to the UI code. The GitHub repo for this project has all the extras needed to run it. There’s a Sync Gateway configuration file, set to talk to a local instance of Couchbase Server. You can also find a PDF with some sample barcodes. 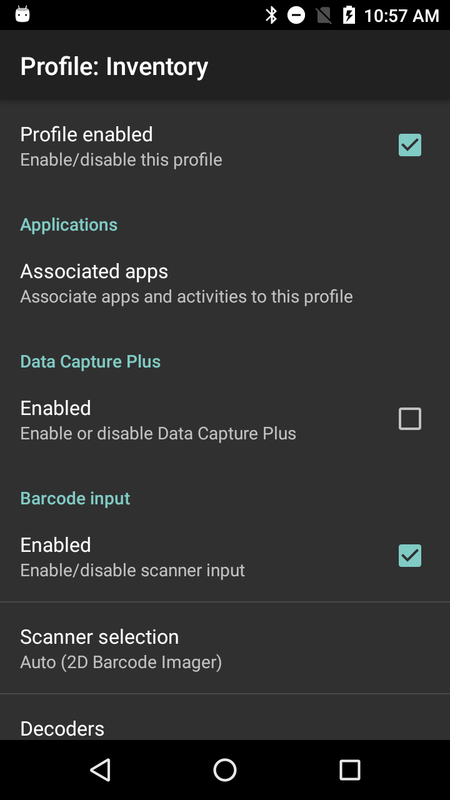 To learn more about integrating barcode scanning into your app visit https://developer.zebra.com. Couchbase is open source and free to try out. Get started with sample code, example queries, tutorials, and more. Find more resources on our developer portal. Follow us on Twitter @CouchbaseDev. You can post questions on our forums. We actively participate on Stack Overflow.